This very affordable Chi Generator® is primarily designed to produce living water and to optimize food, supplements and drinks. Of course you can use it as well to energize body and mind, and, as such, this is an ideal device for weight management, especially when applied in combination with the Weight Management Manifestation Program. An LED (Light Emitting Diode) is on top of the device: This light is blinking in a floating frequency sequence, which is the pulse frequency of the Chi Generator®. 4. 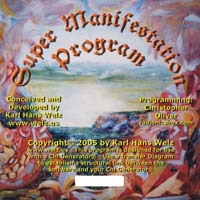 Other applications for general manifestation setups. 5. If you have a non-water optimizing Chi generator® such as the JU 1000 or LPOG 2400 DL, the addition of the CE 99 and simultaneous operation of the two devices will turn this middle-of-the line unit into a water optimizing Chi Generator®. (1) Power Supply: Two AA batteries, which makes the device portable, and a nice backup whenever elictricity is not available. The CE 99 has a two year limited warranty. You can run the device continuously. 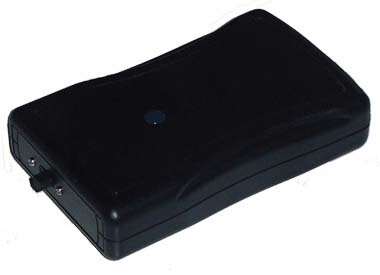 (2) The CE-99 comes with a couple of Chi Transfer Cards for smooth energy transfer to yourself, to others or for the purpose of charging water, food and supplements. Unlike the TC 99 and other transfer devices, which are designed to boost the life energyoutput in addition to the transfer of life energy, this couple of transfer cards is for transfer only. Keep one of the cards on the device and use the other one to charge water, food, drinks and supplements - anywhere on the planet, or simply carry this handy credit-card size transfer card in your billfold to charge yourself with beneficial life energy, no matter how far away you are from your device. This card is especially ideal when you are travelling. (3) The RAOPTC power transfer couple - see above. With this accessory, you can get three times the power of the CE 99. Keep the small disk on the device and use the larger disk to charge water, food, drinks and supplements (in the picture above it is used to charge supplements) anywhere or simply carry it on yourself to give a continuous boost to your energy levels. Both parts are made of super orgonite®. (6) The TC 99 Transfer Couple: For smooth transfer of life energy and to increase the life energy output of the CE 99. 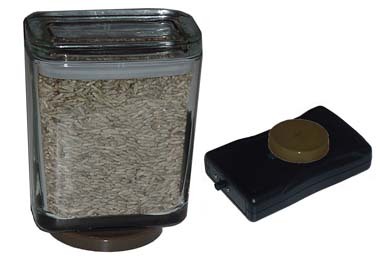 Both parts are made of super orgonite®. You can put one transfer onto the CE 69 and put the other transfer onto your key chain. 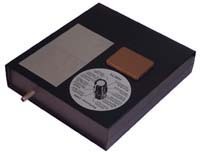 Upon receiving your equipment, carefully inspect your Chi Generator®, exterior module(s), and other accessories. Once the device is turned on, the LED (light emitting diode / control light) should be blinking. After unpacking the device and accessories and checking everything (see previous chapter), take your time to get acquainted with it. Examine the various features in your device as described later when talking about your specific device or devices. Above all, read the manual and especially the success strategies. The more you feel at ease with your device, the more effective your work with it will be. Turn the generator on, then hold the center of your palm (either hand) approximately 2 inches (5 cm) above the Chi Generator®. Most likely, you will feel a gentle warmth, a tingling, or a cool breeze. What you are feeling at first depends very much on the system of nerve endings that react first. Persons who are skilled with their hands usually feel the cool breeze rather than warmth. Distilled water is “dead” as far as life energy is concerned. That’s the reason for its bland taste. For the following experiment you need two bottles of distilled water. One bottle you put somewhere, at least 10 ft away from the Chi Generator®. Point your Chi Generator® at the other bottle for about 5 minutes. Compare the taste of the water in the two bottles. You’ll be amazed, especially since the CE 99 is a water optimizing device! The same way you can energize food, herbs, supplements and drinks. Naturally you can use the transfer cards to charge any water fountain by putting the card next to the supply bottle. It takes about 2 hours to fully charge a 5 gallon bottle. 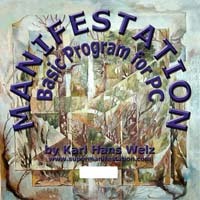 Use filters and/or settings of the manifestation program for: Creativity, Charisma, Convincing Speech, Leadership, People-Skills, Power to Analyze, Scientific Thinking, etc. 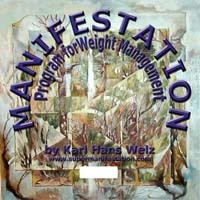 Using the weight management manifestation program, you can work on fitness and weight loss.